An Irish player won the CAPT Seefeld Main Event that our team played. He won 78,000 Euros but no way did he have as much fun as we did! The Living the Dream team – all online satellite tournament winners from Intertops Poker and Juicy Stakes Poker, had a great week in Austria but, all too soon, it’s time to say “auf wiedersehen Seefeld” and head home (with visions of schnitzel burgers dancing in their heads). Chris Perkins, one of the team in Austria, has already won his way to our next poker adventure, TKPT St Maarten, so we’ll be seeing him again soon. Tim "Schnitzel Burger" O'Keefe will be playing in the TKPT online satellite tournament final at Intertops Poker this Sunday so with any luck he’ll be back in our next series of videos as well. Unless you want to take him down and come with us yourself?! There ain’t no joy in Seefeld tonight, the mighty Living the Dream team has struck out. Sadly, all three of the players from Intertops and Juicy Stakes bust during Day 1. Daniel Montagnolli, who was playing pretty aggressively for the early hours of Day 1 was the first to go. He bust at the first level. Chris Perkins was playing pretty tight but was prepared to get aggressive if and when the situation was right. At level 5, just before the dinner break, he went all in when he later realized he should have folded. And he was out. That left Tim O'Keefe as the only member of our team still at the table after the dinner break. Then, 11 hours after they first sat down, he was out too. Watch today’s video for all the gory details. 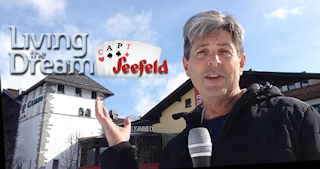 All three Intertops and Juicy Stakes players at CAPT Seefeld are out after Day 1. The Living the Dream team was a little shaken after busting out pretty early in the 550 Euro tournament they played yesterday. 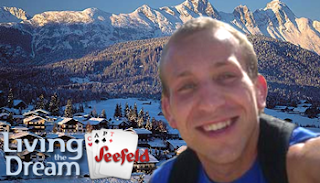 But after a good night’s rest – and a better understanding of how their competition plays -- they’re optimistic about their prospects in the 2000 Euro CAPT Seefeld Main Event that started this afternoon. Video: Living the Dream: CAPT Seefeld, Episode 2 -- What are Ya Gonna Do?! "Living the Dream" -- there's no better way to describe this trip! I've only been in Austria two days and would already say this is a experience of a lifetime. The amazing architecture, history and beautiful scenery has keep me so busy and excited, that I almost forgot we are here to play poker!! Haha It might be too amazing here to play as both Daniel and I have come up short, getting pretty unlucky in a couple of the smaller buy in events so far. No worries though, I'm convinced we are just saving all the main event! The people at Intertops have done an incredible job here and have gone above and beyond for us players. I cannot thank Hjalmer and Larry enough! Chris just arrived today and the three of us are playing a 550 euro tourney with a 200 euro bounty! Unfortunately Chris got sat directly across from me! Lol Should be a lot of fun and get us a little more warmed up for the main! Everyday for the past week has felt like Christmas Eve. 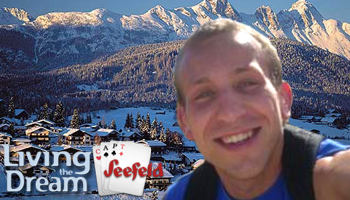 On Tuesday I'll be taking my poker journey overseas to Seefled, Austria. I don't think I could be more excited for the tournament. Prior to leaving on Tuesday, I will be playing a bunch of small local live tournaments as a preparation. I can't stop thinking about the tournament in Austria. For the past few days I have been feeling like I am going to do really well. The structure of this event is by far the best live tournament structure I have played with 50,000 starting stack and 60 minute blind levels. This structure favors my style so much. I really think this is going to be the tournament that is going to allow me more freedom with poker. I don't know why I am getting that feeling, but this just seems like my time. What if I punt off all my chips? What if I get a bad table draw? What if I run into a big cooler early? What if the field is not as soft as I expect it to be? What if I'm too jet lagged to play well? What if I don't meet the expectations of my friends, family, and fellow poker players? What if I brick all the local tournaments prior to leaving for Europe and am doubting my game? All of these things have been running through my mind but I am trying to block them out. I don't know how to get rid of these fears, but I am going to have another coaching session tomorrow with CardRunners Pro John Gonzalez to hopefully help me overcome these negative thoughts and help me feel more prepared for the CAPT Main Event. I know most people would say "just enjoy the trip and don't think about the tournament" and I want to do that, but my overall goal for this trip is to win the main event and anything less will be a failure to me. I look forward to sharing this adventure with anyone who cares about this trip and how I do. I'll be posting pictures, videos, and chip updates of the entire experience here and would love to have all your support. 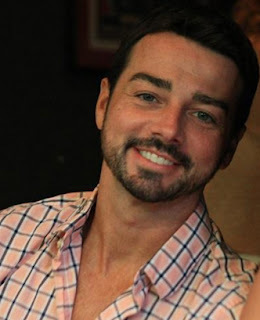 I recently had my first coaching session which was incredibly helpful in finding some of my leaks. I want to make coaching a regular thing, if for nothing else to stay mentally focused during the downswings. In addition to these scores, I also won a package to the TKPT Main Event in St. Maarten on Intertops Poker. The event is $1,100 buyin with a 100K GTD. They're still running online satellites for this so you can still win your way to the Caribbean and join us in St Maarten! I played the $225 Deepstack at Rivers Casino but I busted in level 5 in a spot where I should have pot controlled and not had all my chips in the middle. Although poker has been good to me lately, I still feel like I am making really crucial mistakes. I have been unable to close out a tournament and have felt very spewy in spots. If you'll be playing any of these events, come say hi. I am hoping to gain some confidence playing these small tournaments before I leave. Thank you for the support and stay positive. Check Living the Dream at the end of this month when we’ll have daily video reports following Tim, Robert, Chris and Daniel living the dream at CAPT Seefeld.